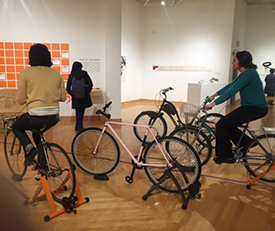 This exhibition was curated, produced, and marketed by arts administration students at ISU. We are a group of students at Indiana State University who are exploring digital imagery dealing with the theme of how technology impacts our relationships to the world around us. We are a young generation immersed in mobile technology that is easily accessible and prominent in our everyday lives. We are interested in the way technology, including phones, social media, and other communication tools, impacts and complicates our relationships with others and the world around us. Our class is focused on learning curatorial studies and arts administration, and we are gaining experience by creating an exhibition from scratch. Through this class, we have learned how to produce, market, budget, install, and coordinate an exhibition featuring professional artists. Whitney Lynn is a visual artist who mines cultural and political histories to question ideas of boundaries and containment, history and restaging, context and form. She leads the interdisciplinary Honors in the Arts program at Stanford University and will be an Artist-in-Residence at the de Young Museum in 2017. Tracy Miller-Robbins is an interdisciplinary artist working with drawing and experimental forms of animation. She received an MFA from the University of Cincinnati and her BFA in Painting and Drawing from the Art Academy in Cincinnati. Ms. Miller-Robbins is an Associate Professor of Animation at the Columbus College of Art & Design and has exhibited her animated installations and projections in the US, and internationally. Heath Schultz is an artist and writer currently living in Austin, TX. He is a lecturer at the University of Texas at Austin. Kristen Hixson is an emerging artist living and working in Salt Lake City, Utah. She is interested in the invisibility of our most common surroundings. John C. Kelley is an artist and musician whose work in video explores the intersections of narrative and cinematic abstraction. His video work has screened in galleries and film festivals internationally. Jared Kelley is a writer and performer bringing highlights from space into poetic narratives. My work is meant to create mood for performances or to create the ambient base for environmental installations. Frederick Bamfo is part of a new generation of Ghanaian contemporary artists who is redefining Ghanaian modern art. He has received several academic honors and has been featured in various exhibitions locally and internationally. He served as a Teaching Assistant and Research Assistant at the Department of Painting and Sculpture in Kwame Nkrumah University of Science and Technology, Kumasi where he obtained his BFA and MFA. He has exhibited in Incubarte 7 Biennale Exhibition in Valencia, Spain, Barclays L’Atelier Competition Exhibition in Johannesburg, South Africa and It's LIQUID International Art Show in Venice, Italy. and cultural issues. Her work has been exhibited in spaces such as Istanbul Biennial, the Van Abbe Museum in the Netherlands, Holon Design Museum, Liverpool Biennial, Arebyte Gallery London and ACRE TV. Daniel Wechsler is an emerging video & print artist, with academic certification in audio engineering (SAE, London). Focusing on the creation of new video techniques, he uses computer errors and malfunctions to create visual 'bugs'. Russell J Chartier & Paul J Botelho explore the fabric of memory through multilayered video and audio. The work develops the metaphor of an ocean of memories where fragments of childhood, love, and loss are intermingled together weaving a complex tapestry forged from the moments that make up our lives. 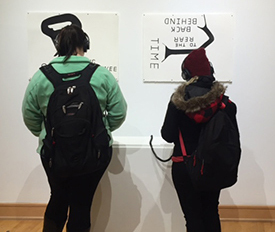 The piece examines the transmutation of time and cyclic nature of the human condition through a portrayal of the multilayered syntonic meaning of memory. Martina Manalo is a photographer and a contemporary mixed media artist as well. Her works are inspired from the dreams of the clouds, nostalgia, melancholic memories and teenage ennui. Manalo’s abstract works explore the release of nervous tension, anxieties and angst from a universal perspective; from subjective and objective viewpoints. Barbara and Ale live and work in Milan. They began working together in 2005 during their specialization in Visual Arts at the Academy of Fine Arts of Brera (Milan). They have exhibited at the Centre Pompidou in Paris, Pac in Milan, Rauma Art Museum in Rauma, Merz Foundation in Turin, Sandretto Re Rebaudengo Foundation in Turin, Bevilacqua La Masa Foundation in Venice and at the National Art Gallery in Tirana. 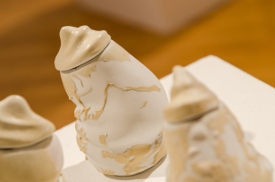 Katina Bitsicas holds an MFA in Studio Art from the University of South Florida. She is a new media artist who utilizes video, photography, and performance in her artworks. Her works are based on personal stories, which she uses to explore larger political, social, and psychological issues on a more intimate level. Katina has exhibited her artworks both nationally and internationally from Sweden to Los Angeles, and worked on the Academy Award shortlisted documentary, Battle for Brooklyn. She is currently an Assistant Teaching Professor of Digital Storytelling, which is in its inaugural year at the University of Missouri. Carlos Rene Pacheco is an artist and photographer from Tucson, Arizona. He currently resides just outside the Fargo/Moorhead area and teaches photography at Minnesota State University Moorhead. Jean-Michel Rolland is a French artist born in 1972. A musician and a painter for a long time, he melts his two passions - sound and image - in digital art since 2010. At the origin of each of his creations, musicality plays a role as important as image does and each one influences the other in a co-presence relationship. George Bates is a Brooklyn, NY based artist who has created several permanently installed public art projects in the USA. A major theme in his work is the micro and macro nature of systems and an interest in how one can have a thoughtful reflection with these depictions and find one's own place within them. Leticia Sampedro's video-works represent obsessive behavior often associated with the internet and social media. Repetition is key in them. While portraying anxieties, their aim is to be meditations, turning a vicious cycle into a healing one by adding perspective to it. She explores the spectrum of the natural vs. the artificial, of what is acquired and what is pre-existent, all within the context of modern technologies. Working mainly in video and sculpture, Ron Lambert investigates the intersection between psychology and the environment. 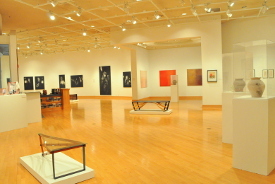 Ron has shown in galleries nationally, including the Urban Institute for Contemporary Art in Michigan, the Blue Star Contemporary Art Museum in San Antonio, the Center on Contemporary Art in Seattle, the New Britain Museum of Art in Connecticut, and several college and university galleries around the country. His videos have been screened internationally including the Crosstalk Video Festival in Budapest Hungary, and the Sanluan Yishu project in Beijing China. Laurene Bois-Mariage is a French artist presently living and working both in Estonia and Finland. She is particularly interested in collective practices of photography, in its actual contexts of production and diffusion, as well as in its place within social media. Monkeyhouse is an award- winning nonprofit that connect communities with choreography. While Monkeyhouse's choreography is regularly presented in concerts, galleries, and off beat locations around Boston and New York and New England, in our first 15 years we have toured to San Francisco, Minneapolis, Winnipeg, Philadelphia, and Chicago as well as participated in diplomatic delegations to Tiznit, Morocco. Katya Grokhovsky was born in Ukraine and is based in New York. She holds an MFA in Studio from the School of the Art Institute of Chicago and a BFA from Victorian College of the Arts, Melbourne University, Australia. 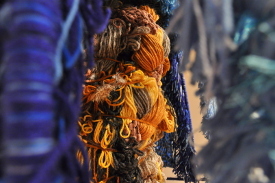 She has received numerous residencies, fellowships and awards and has exhibited her work extensively. Matthew Flores is a multimedia artist based in Columbia, Missouri. He will begin pursing his MFA in Photography at the Lamar Dodd School of Art at the University of Georgia this year. Olga Guse is a Russian artist whose videos have been show internationaly. Cassander Eeftinck Schattenkerk has exhibited in numerous venues in The Netherlands and abroad: Italy, Hong Kong and the UK. Using nature and scientific imagery as his inspiration, he stages natural phenomena. Jonathan Johnson is an artist and educator based in Columbus, Ohio who uses various forms of photography, film and video to explore ideas about place and nature. He has exhibited his films and photographic work in over 30 countries. Currently, he is an Associate Professor of Photography and Digital Media at Otterbein University in Westerville, Ohio. Kate MacDonald is a Canadian multidisciplinary artist. She is currently represented by the Los Angeles Center for Digital Art, where she was selected as one of Ten Artists to Watch in 2012. Her light graffiti projections have most recently been presented at the International Symposium of Electronic Art (ISEA 2015) held at Simon Fraser University in Vancouver, BC. She regularly collaborates with artist Les Sears as K8L35. This event was made possible by a grant from the ISU Center for Community Engagement.